Jaba - Animal Wonders Inc.
Jaba was adopted in December 2008. 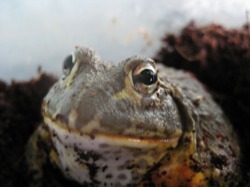 Jaba is a female Pixie Frog and you can tell this because she has a white chin while males will have a yellow chin. Females grow to be about 6 inches in diameter instead of the 10 inches that a male would grow, which is still quite large for a frog! Jaba loves to burrow and is a fantastic eater, sometimes jumping across her cage to catch a cricket. We're excited to be able to watch her grow to her full potential.